After a long summer of poorly-received blockbusters, it looks like the relief of the fall movie season is almost here. Based on the trailers, I didn't expect the heist film Hell or High Water to officially start the year's run of award contenders, but trailers don't always signal the quality of a film (I'm looking at you, Suicide Squad). Few comparisons are more generous or favorable for a movie than that of No Country for Old Men, but it's hard to walk out of Hell or High Water without comparing the two. Somewhere between a cops and robbers drama and a Western genre film, Hell or High Water spotlights Toby (Chris Pine) and Tanner (Ben Foster), brothers living in Texas who, after recently losing their mother, decide to run a spree of bank robberies over the course of one week. The brothers are building to some sort of financial goal that is slowly disclosed through the course of the film, but Texas Ranger Marcus (Jeff Bridges) begins to detect the brothers' pattern and closely pursues. While this film doesn't have an analog to the skin-crawling villain of Javier Bardem's Anton Chigurh, it does spotlight a villain that, for many Americans, might be a little more personal: big banks that are foreclosing on the homes of low-income residents of Texans. Though perhaps a little too on-the-nose at time (the film opens with graffiti ripping the banks apart for getting a bailout while American soldiers have come home to nothing - it works, but I've never seen such detailed graffiti in real life), Hell or High Water is a movie with a clear mission statement. 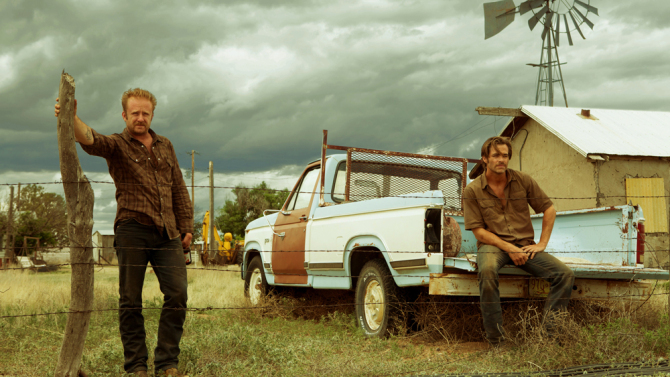 What I appreciated most about Hell or High Water was the way the story unraveled at a cautious, deliberate pace while still keeping the thrill/heist element present throughout. Toby and Tanner are in a situation that automatically puts them in a bit of a moral gray area despite being criminals - their backs are against the wall, financially, and they're stealing from "The Man" a la Robin Hood. But their plot is more complex than that, and rather than laying all of the cards out on the table to start, writer Taylor Sheridan (Sicario) slowly moves us through their motivations, as well as the drive behind Texas Ranger Marcus's desire to track them down. The film also looks more broadly at the cultural landscape of these characters, highlighting the extinction of The American Cowboy and his way of life. Pine, Foster and Bridges stand toe-to-toe as the top performers of this film, and they're all perfectly cast. But I'd argue the real MVP of Hell or High Water is writer Sheridan, who managed to capture the same level of intensity and dread as Sicario. I was also surprised by the level of care and restraint exercised by director David Mackenzie, whose previous credits are a bit of a mixed bag. We'll see what the rest of the year has in store, but this was a hell of a way to start the season. It wouldn't surprise me to find that Hell or High Water is a strong contender for awards season in multiple categories.